Trends computed from yearly averages at meteoLCD, Diekirch, Luxembourg. 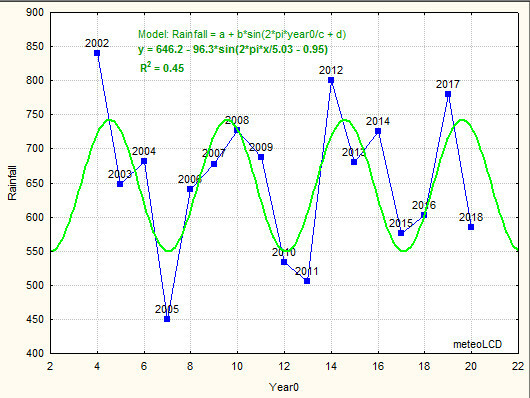 Attention: in all trend equations (y = a+b*x) the variable x represents the year, with x = 1 for the first year in the trend period. 3. 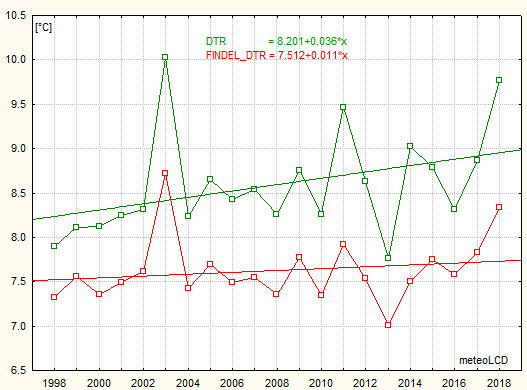 Diurnal temperature range (DTR) trend since 1998 is positive (= no anthropogenic warming fingerprint ). NO/NOx measurements have been definitively stopped at the end of 2017. Please note the succession of 3 different instruments; after the definitive breakdown of the Teledyne API400, the old O341M sensor from Environnement SA was used again and finally replaced by a CAIRSENS O3&NO2 in 2018. As NO2 values are below the minimum of this instrument, readings can be taken as O3 only. A comparison has shown an excellent concordance with the official Beckerich station. After 3 years of slight thinning, the TOC is again increasing. See   ( shows strong positive trend starting 1990 for latitudes 45°-75° North, Europe):  give +1.32 DU/y at the Jungfraujoch for 1995-2004. See also recent EGU2009 poster . Attention: The instrument for measuring CO2 (API Teledine E600) has been replaced by a Vaisala GMP343 sensor the 27 Jun 2017. The mean value seems impossible high, so a zero bias should be considered possible! The 1998-2001 data are too unreliable to be retained for the trend analysis. 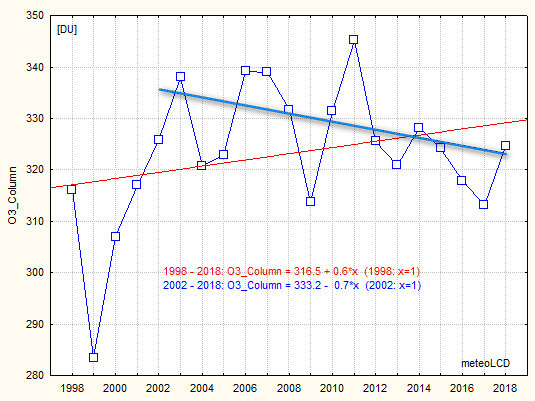 The sharp plunge in 2013 should be taken with caution; there also was a change in the calibration gas the 21 Jan. 2014. 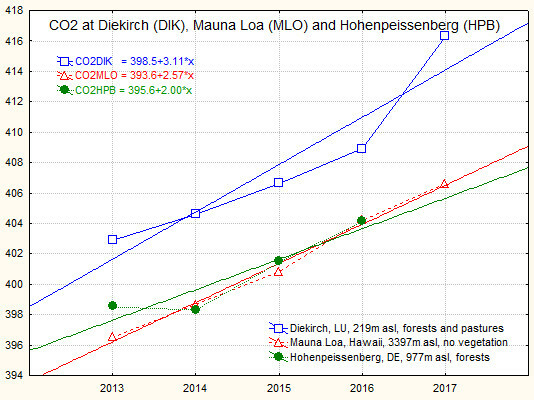 The second picture zooms on the last 5 years, and gives the readings of Diekirch (DIK), Mauna Loa (MLO) and Hohenpeissenberg (HPB) from 2007 to 2017; 2018 data are not yet available. Note the very different elevations! Mauna Loa has no vegetation at all, Diekirch and HPB similar grass and forests. 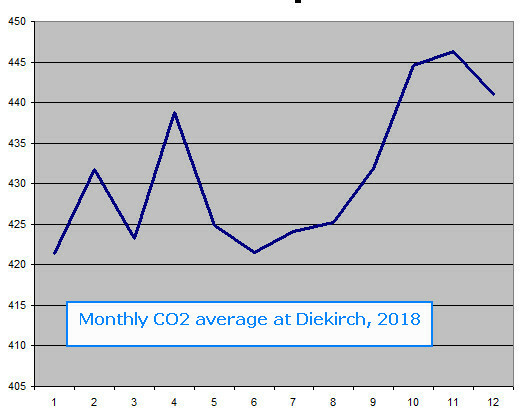 The CO2 data (monthly averages) show the summer-time lows, which reflect the impact of variable seasonal photo-synthesis (see here). A simple 12 month periodic sinus pattern was found in 2014 and 2015. 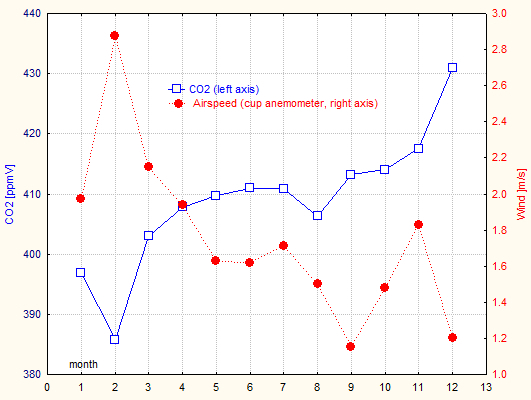 Actually, as shown in addendum 3, the CO2 lowering intensity of wind speed seems to be an important modifier of this pattern, possibly masking the effect (or better: the non-effect) of photosynthesis. This happened in 2016 and 2017: the summer low is quite prominent, but the seasonal swing is much less sinusoidal. 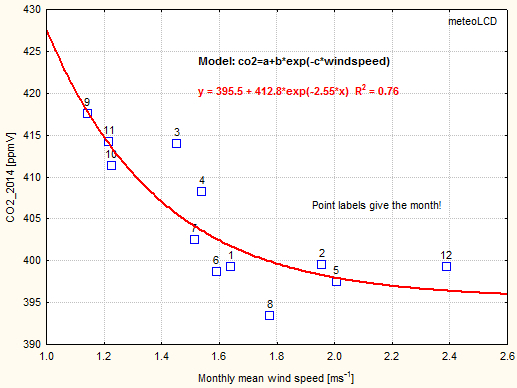 See the end of addendum 3 for a picture of CO2 versus windspeed. The sensor location has not been moved since 2002! Sensor is a PT100 (see comments in 2015_only.xls); new 4-20mA amplifier (with calibration) installed the 4th May 2016. Highest decadal Central England warming trend from 1691 to 2009: +1.86°C/decade for 1694-1703! 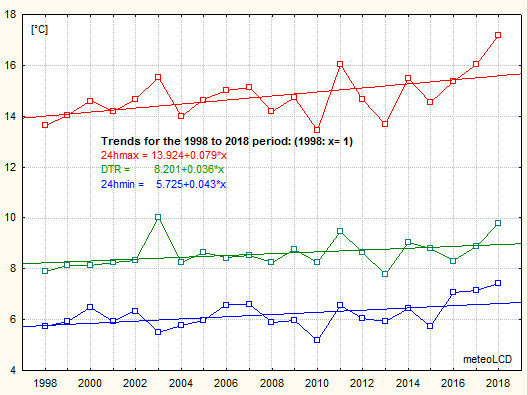 For 1998 to 2018: all trends are positive, the 24hmin trend is lower than the 24hmax trend. A fingerprint of climate warming is that daily minima increase more rapidly than daily maxima so that the DTR trend should become negative. This fingerprint does not exist here (and neither at the Findel station, see next plot). 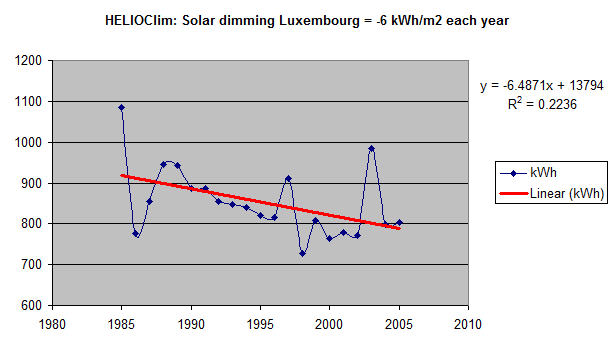 The BEST observational data set for Luxembourg  stops at 2013. 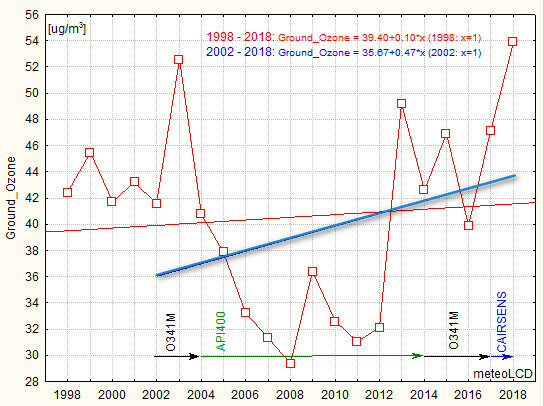 For our latitude of 50° North, BEST shows a positive DTR trend for the period 1988 to 2011, whereas theCMIP5 multi-model mean gives a similar but negative trend... so much for the concordance between climate models and observations! (graph here). 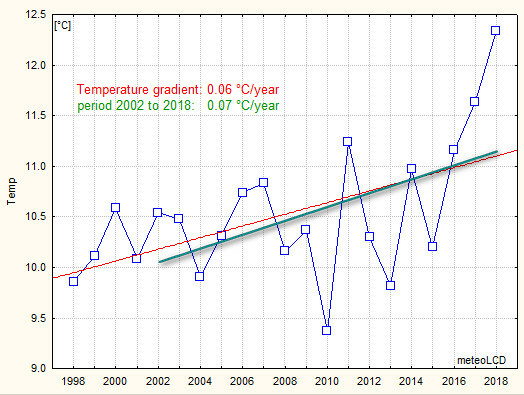 The trends show warming winters since 2002 to 2018, with the warming probably caused by the NAO. 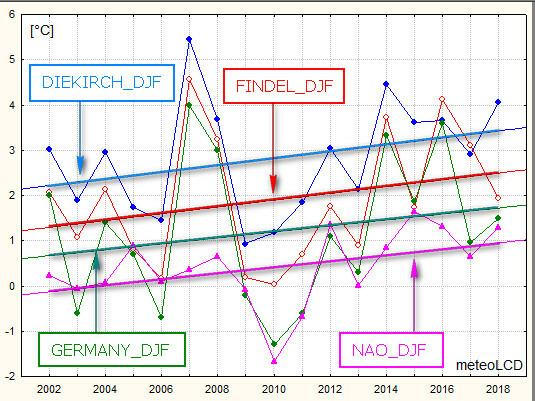 The trend for Diekirch is close to that of NAO index. The North Atlantic Oscillation clearly influences our winters (but note the exception for the strong 2016 El Nino year! 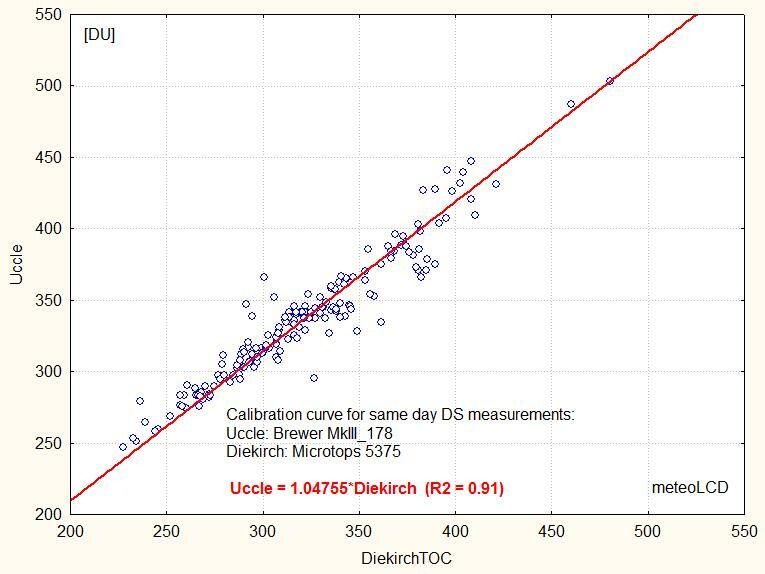 ); the correlations between the Diekirch DJF temperature series and the NAO_DJF normalized index is statistically significant (=0.59) at the 5% level. See  on how the energy content of moist air is calculated. Several authors, (e.g. Prof. Roger Pielke Sr.) insist that air temperature is a poor metric for global warming/cooling, and that the energy content of the moist air and/or the Ocean Heat Content (OHC) are better metrics. 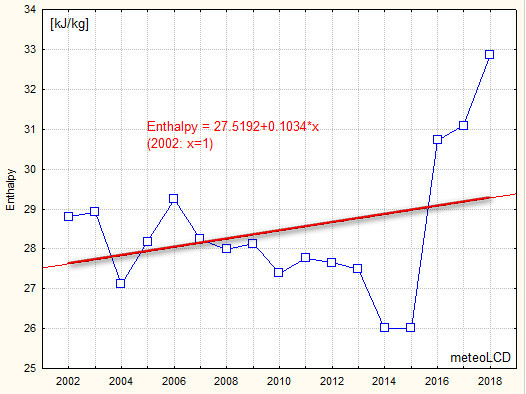 Mean yearly moist enthalpy values are mostly very close, but they may change from zero up to 60 KJ/kg during a year. Moist enthalpy can not be calculated for temperatures <= 0 °C. Trend is slightly positive from 2002 to 2018; the 2016 "monster" El Nino extended into 2017 . 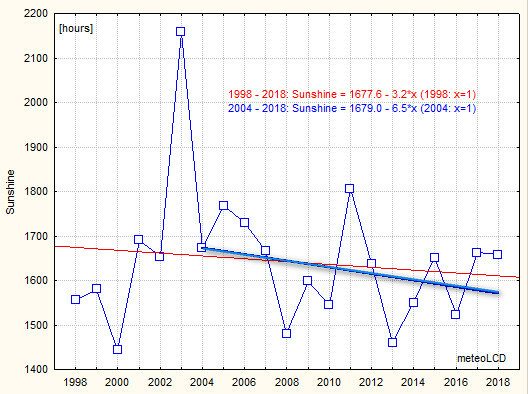 The negative trend from 1998 to 2018 seems spectacular: -94 mm/decade, caused by the very high values of 2000 and 2001. The 2002-2018 period has a very slight negative trend of 16 mm/decade. Clearly precipitation shows an oscillation pattern, so linear trends should be taken with precaution (or simply seen as non-sensical). A good model for the Diekirch data is a sinus function: the calculation (Levenberg-Marquart algorithm) suggests for the interval 2002 - 2018 a 5.03 years period (~70 months, R2 = 0.45; in the model x = 0 corresponds to 1998), with a mean value of 646 mm and an amplitude of 96 mm; the phase shift of -0.95 rad is close to 1/6 period. gives short term periods of 6 to 7 years for the Western European region. 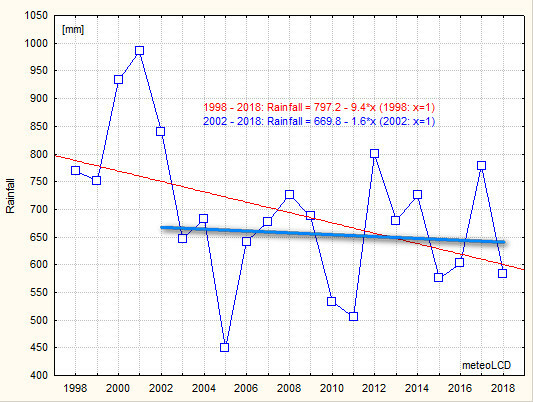 The rainfall pattern is a good example how foolish it is to apply linear regressions to periodic data, something the media, activist groups and many politicians are fond of. The decline from 2015 to 2017 is clearly visible in the German PV electricity production, but the negative trend reverses for the very sunny year 2018 . This graph shows the plots of the four above-mentioned stations. It should be noted that meteoLCD (Diekirch) is located in a valley, Findel, Trier and Maastricht airport on top of a plateau. The Findel totals are much higher than those of the other stations, which certainly is also partially caused by the use of the Campbell-Stokes instrument known to give too high readings (in July and August the excess of Findel readings was highest). All 4 stations give totals that practically always vary in the same manner (synchronous increase and decrease). The trend over 2002 - 2018 is slightly positive, the trend line from 1998 to 2018 should be taken with a grain of salt, as the 1998 readings seem abnormally low. See  and  (poster finds slight positive trend in June (+2%) and negative trend in August (-1%), no trend for other months, for period 1991 to 2008. Trend from 2002 - 2018 is very slightly negative. 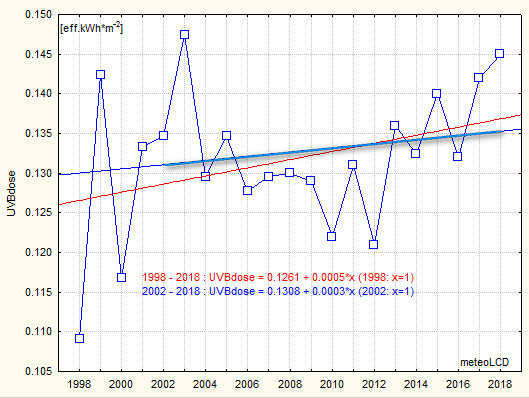 The 2 independent measures of solar energy and UVA doses all point to a very slight solar dimming since 2002 despite 2018 being a very sunny year. (End of measurements useable for trends in 2013. Measurements stopped in 2017). Attention: only 78% of possible measurements available due to sensor downtime! The NOx/NO measurements by the AC31M instruments from Environnement SA have been stopped the 30 December 2017. The AC31M has reached its end of life. see  which gives ~30% reduction from 1990 to 2005 for the EU-15 countries. 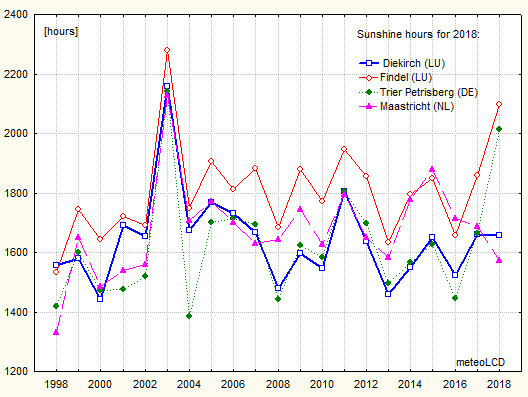 5 Rebetez, Beniston: Analyses of the elevation dependency of correlations between sunshine duration and diurnal temperature range this century in the Swiss Alps. 1998. 6 R.G. Vines, CSIRO: European rainfall patterns. International Journal of Climatology, vol.5, issue 6, p. 607-616. 7 http://global-warming.accuweather.com (15 Jan 2009). 8 J.W. Krzyscin, J.L.Borkowski: Total ozone trend over Europe: 1950 - 2004. ACPD, 8, 47-69, 2008. 9 NASA: Solar Physics: The Sunspot Cycle. 13 K. Makovski: The daily temperature amplitude and surface solar radiation..Dissertation for the degree of doctor of sciences. ETHZ 2009. 16 Van Malderen, De Backer, Delcloo: Revision of 40 years of ozone measurements in Uccle, Belgium. Poster, EGU2009, Vienna. 22 De Backer & Van Malderen: Time series of daily erythemal UVB doses at Uccle Belgium. Poster, July 2009. 46 Kämpfe, Kowatsch: Winter 2014/15 in Deutschland: Erneut zu mikd - warum ? 2014 update! Lindzen & Choi  define the non-feedback climate sensitivity as ΔT0 = G0*ΔF, where G0 = 0.25 Wm-2 and ΔF is the change in radiative forcing. 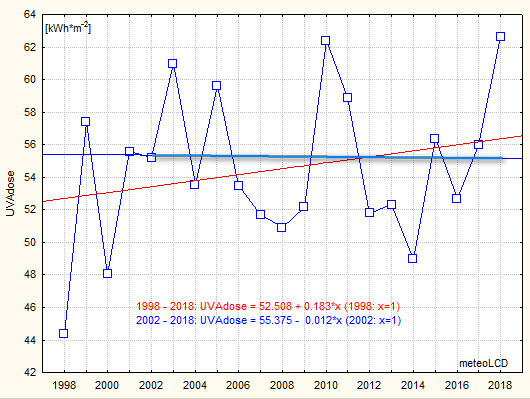 A change in solar irradiance of -0.82 kWh*m-2y-1 (decade 2005 to 2014) corresponds to ΔF = - 820/8760 = -0.09 Wm-2 and should yield a cooling of ΔT0 = -0.25*0.09 = -0.02 K (or °C).per year. The meteoLCD measurements give a cooling of 0.0057 Ky-1, about 3 times less. Scafetta  defines a climate sensitivity in respect to changes in solar radiation by k1s = ΔT/ΔF and finds k1s = 0.053. Our data for the decade 2005 to 2014 give ΔT/ΔF= - 0.0057/(-0.09) = 0.06, a value close to that of Scafetta!. 2018 update! 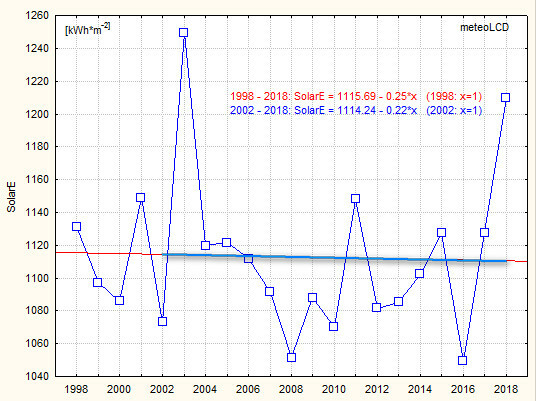 It makes for an interesting exercise to compare the influence of mean yearly solar forcing on moist enthalpy and air temperature for the 17 years period 2002 to 2018. 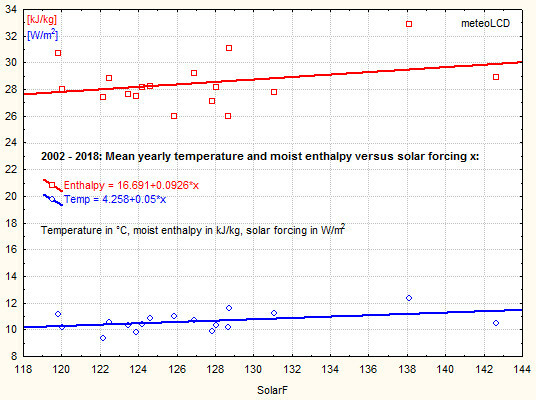 Both air temperature and moist enthalpy are positively correlated to changes in solar forcing ( = mean solar irradiance). The Pearson correlation between mean solar irradiance and moist enthalpy is 0.73 and is significant at the p = 0.05 level, whereas the correlation between mean solar irradiance and temperature is 0.42 (not significant). A change of 1 Wm-2 of mean solar irradiance would cause a (big!) average heating of 0.5 °C per decade and a change of 0.9 kJ/kg of moist enthalpy per decade. Possibly taking into account some lag (as for instance 4 months for temperature lagging solar forcing) would change these numbers. Our temperature measurements give a heating of 0.7°C/decade for the same period (Findel shows 0.5°/decade), which is close to the correlation given if the solar irradiance was the unique warming influence! 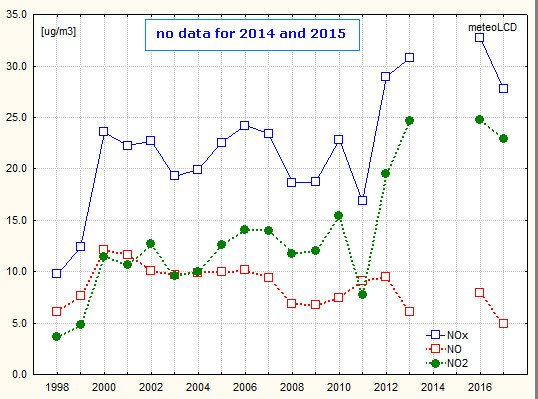 A short analysis of the seasonal CO2 pattern in 2014. 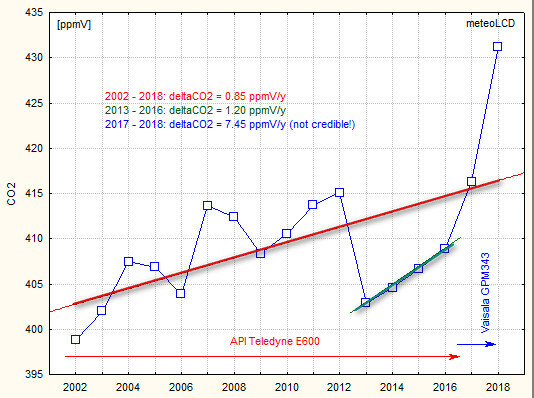 The mean monthly CO2 data show an oscillatory pattern which can be modeled by a 6 month period sine wave. This is not consistent with the commonly admitted explication that the summer lows and winter highs are a fingerprint of changing photosynthesis, which should lead to a single annual sinus wave (as in 2013). The 6 month period is essentially caused by the low Jan, Feb and Dec values, and is replaced by the usual 12 period if these months are omitted. 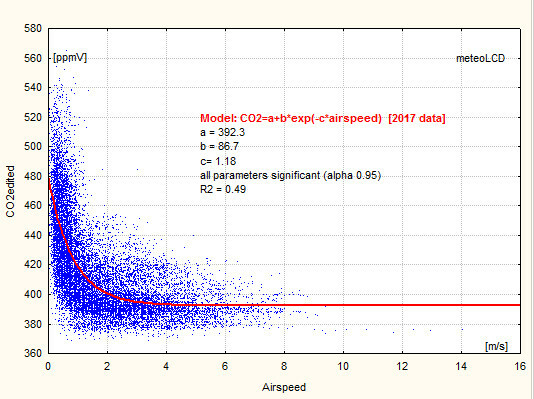 The next figure gives the CO2 mixing ratios versus the monthly mean wind speed; the usual exponential model beautifully describes this pattern. 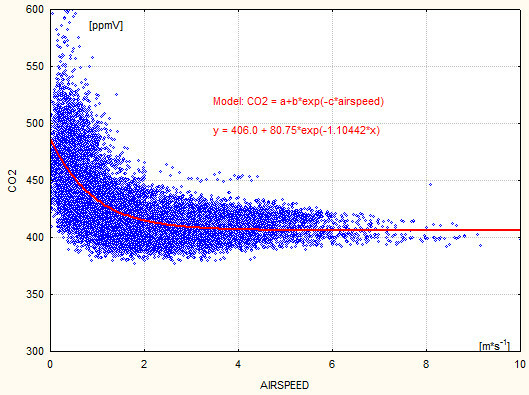 The horizontal asymptote of 395.5 ppmV should correspond to the background CO2 level, as shown in . There is some debate about the (global) changes of the seasonal CO2 amplitude, which seems to increase due to global greening , agricultural green revolution , changing air trans-continental circulation  and possibly other unknown factors. Look also at the presentation . Locally it seems that the effects of higher/lower wind speeds and photosynthesis are difficult to untangle. 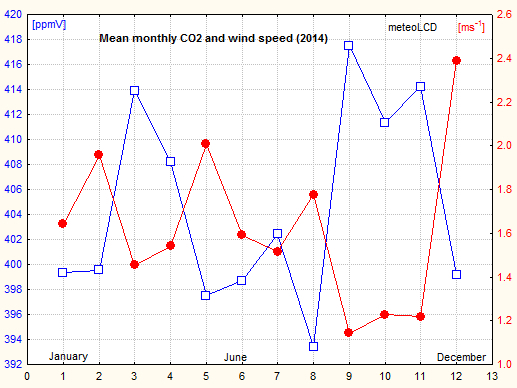 If we restrict our data to those days where the mean wind speed is less than 1, the correlation between CO2 and wind speed is lower (-0.76) but still significant. Curiously all the papers studying this seasonal amplitude problem seem to ignore the influence of changing wind speeds. 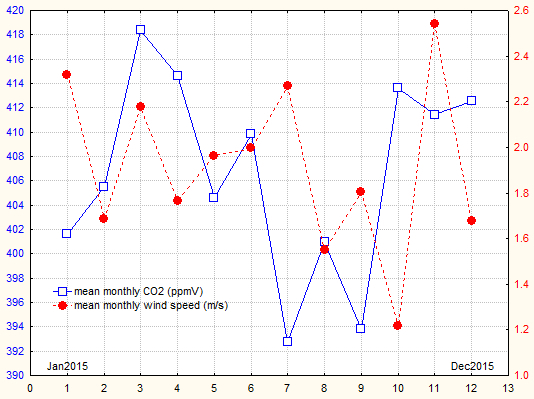 Here again higher wind speeds usually go together with lower CO2 levels (notice the exception on March! ), but the monthly mean values do not follow the usual model well. If we take all 17520 individual measurements, the picture becomes clearer, and we find that our "bumerang" model follows reasonably well the overall pattern. 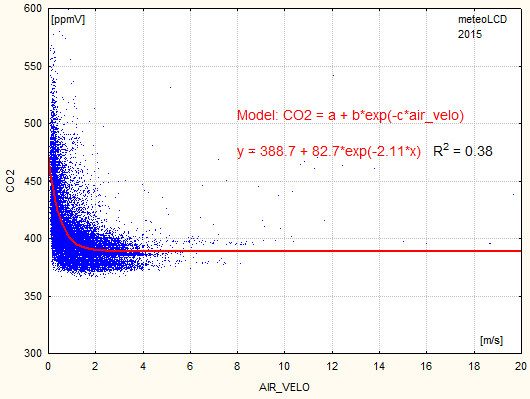 The horizontal asymptote suggest a background CO2 level of about 389 ppmV, which seems a bit low. The high wind speeds lower the January , February (and December) values which normally should be higher; so the "usual" sinus pattern with a trough during the summer months is mostly absent. 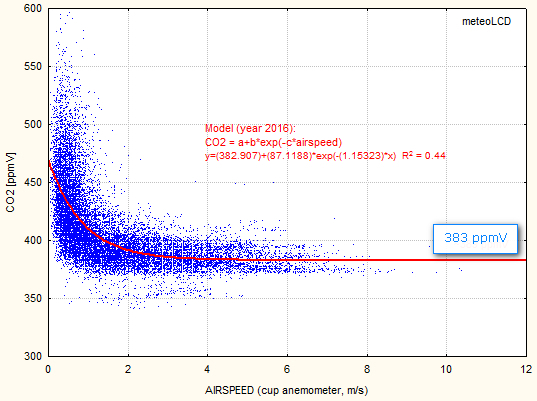 Using all CO2 measurements of the year, we find again our boomerang pattern; the usual model has a better R2 than in 2015, but the asymptotic value of 383 is definitively too low! The Mauna Loa average CO2 mixing ratio for 2017 is 406.6, which would suggest that our asymptotic value of 392.3 is too low. If we use only the measurements by the new Vaisala GMP343 sensor, the asymptotic value becomes 395.7. The Mauna Loa average CO2 mixing ratio for 2018 is 408.5, so our asymptotic value of 406 is quite close. The R2 of the model (the goodness of the fit) is also quite acceptable: R2 = 0.50. All parameters are significant at the 5% level (alpha = 0.95). 18 Jan 2019: Start of update to include 2018 data.